If you are thinking about insulating and covering the exterior walls of your property, you have many options at your disposal. For example, you can go for vinyl siding, wood siding as well as aluminum siding. These days, more and more homeowners are attracted by aluminum siding and the benefits it brings. If you haven’t installed aluminum siding on your house before, here are 7 great reasons to do it now. As you can probably imagine, different types of siding materials come at various prices and if you don’t have a very big budget at your disposal, you might want to opt for aluminum siding. This siding material is less expensive than other materials available on the market and it can be installed with little to no effort by the professionals. Other siding materials can cost up to 80% more than aluminum siding and they require more time for the installation process to be complete. In a similar fashion, aluminum is a siding material that can be painted if you want to improve the way your house looks or you are tired of a particular color. This is not possible for other types of siding materials. Additionally, you might be happy to know that aluminum siding can be replaced in sections if you want to update the looks of your property and make it more attractive at some point in the future. One of the biggest advantages of aluminum siding is the simple fact that it can last for at least 40 years, especially if it is properly maintained, at it is very resistant to wear and tear, in comparison with other siding materials which cannot last nearly as much. Additionally, any small damages like corrosion signs or scratches can be fixed with little to no effort by sanding and painting that particular area. Any dents that might be found on your aluminum siding can also be repaired easily and cheaply. If for some reason you have a particular area of aluminum siding which is badly damaged then you can simply replace the aluminum section as mentioned before. As a result, your property will look gorgeous again and you don’t have to spend a lot of money or waste a lot of time in order to achieve this. You might be happy to know that your energy bill can be drastically reduced if you improve the insulation of your property. Luckily, aluminum siding can protect your house against heat loss because it offers better insulation, in comparison with other siding materials. Therefore, during hot summer days, the coolness in your house will not be lost and you won’t have to use the air conditioning unit that often, saving a lot of money in the long run. Similarly, during freezing winter nights, your aluminum siding will prevent heat from escaping, making the property warmer, safer and more comfortable for you and your family members. If you have some free time and you like being with a hammer in your hand from time to time then you might be happy to know that aluminum siding can be installed by yourself without much effort. All that you need are a few tools which are not that expensive and can be rented from a local hardware store and a free weekend. However, if you want to reap all the benefits aluminum siding provides, make sure that you let the professionals install it for you, just to have more peace of mind. Thanks to the fact that this siding material is so flexible and lightweight, it doesn’t require a lot of time in order to be installed. In fact, the professionals can install your aluminum siding in just one day, especially if your property is not that big. This material is increasingly popular these days because it looks clean, modern and very elegant. That is why you see mobile phones and tablets that feature certain elements made from aluminum as well as many vehicle wheels made from aluminum alloys. If you install aluminum siding, your property will become more eye-catching and it will feature a modern and stylish look which will increase its value, so that when you sell or rent your house, you can confidently ask for more money. If you want to install aluminum siding in the upcoming days, make sure that you give us a call and take advantage of our professional services. We install top quality aluminum siding that comes in various colors and we charge a fair price for our services. Aluminum siding has long been proven as the preferred choice for siding in Toronto. This is because when moist or salty air comes into contact with the aluminum siding it forms hard oxides of the metal which cover up and protect the metal from further damage. Step 1: Check whether the siding is made of aluminum or steel. Use a magnet, if the magnet stick to the siding then it is steel. If it is steel consult a professional on how and what to paint it with. Step 2: Using a pole slander remove any dirt or plants off the siding and thoroughly rinse any detergent that is on the siding. Step 3: Lightly sand the siding wherever necessary. This will allow the paint to adhere to the siding and prevent chipping of the freshly dried paint. Step 4: Assess the siding and decide whether it needs primer coating. If unsure of where to apply it just apply it to the whole siding and leave it to dry. Step 5: Finally finish the process by applying a coat of Acrylic Latex. Use one with a low luster or satin finish as it gives the original look. If possible, use an airless sprayer; you can easily rent out a machine in the Mississauga area. An eavestrough is a narrow channel that is connected to the edge of the roof. It is also known as a rain gutter. This allows it to collect water and draw the water away from the roof and prevents the water from damaging the roofing structure of a building. Siding on the other hand is an outer covering or layer that is placed on the walls of the building and protects the building from damage from weather, especially rain. The materials used to make siding include; thatch, shingles, metal, stone, wood, plastic and others. Aluminium siding is specifically used for homes in areas with coastal climates. 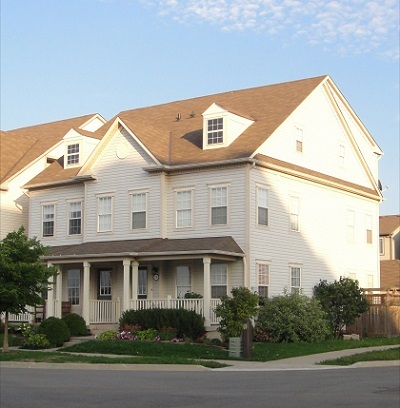 Buildings with eavestroughs and sidings tend to have a higher value than buildings without them. This is because they protect the house from all-weather related aspects. Aluminium sidings are great for areas whose air contains a lot of moisture and salt. This is because the aluminium reacts with air to produce aluminium oxides which coat the surface and prevents further damage. With a few modifications eavestroughs and sidings can be used to collect rain water and stored in a tank. This is a great way of reducing water bills for watering the lawn, gardens and for washing purposes.